Quick easy dinner that is hard to beat. It tastes like a healthy dairy free carbora. Try to use whole wheat pasta or gluten free pasta such as brown rice pasta to give this dish more fibre and make it healthier. The coriander pesto is really fresh and super tasty. If you don’t have the time to make the coriander pesto then use our Happy Pear Coriander and cashew pesto or any of our pesto for that matter! 1. Boil the pasta as per instructions on the back of the pack. 2. Peel the garlic. In a blender or food processor put all the remaining ingredients for the pesto in and blend till you get a smooth, creamy consistent texture and a great taste. 3. Once the pasta is cooked, drain and rinse in a colander over the sink to remove the starch so it doesn’t stick. Return it back to the pot. 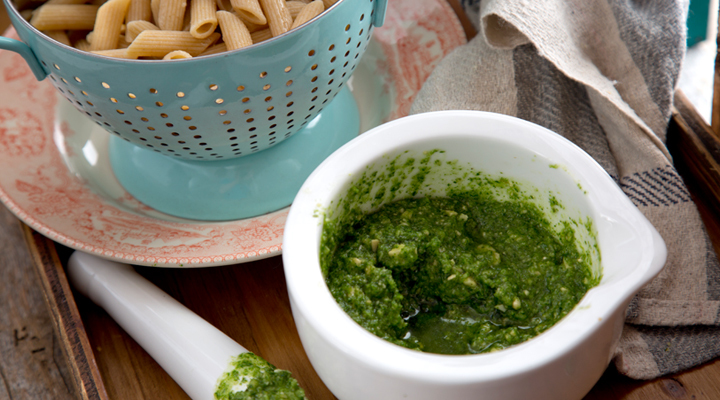 Add the coriander pesto to the pasta and mix it through, heat up on a medium heat till pesto warms up. 4. For colour garnish with whole pink peppercorns and for a little spice garnish with some chilli flakes.